Join me tonight at 9PM EA as I welcome Haiti-based Chef David Destinoble, the star of this Saturday's Matinée Brouhaha! at La Caye in Brooklyn, NY. Originally from St. Marc, Haiti, Chef David moved to Florida at a young age. He later studied Culinary Arts at Johnson and Wales University, where he learned the fundamentals and developed his own unique style and flair. He worked his way up the ranks at some of Miami’s most exclusive restaurants and hotels, such as Chez Danielle, La Belle Auberge, and The Hilton. Chef David has now moved back to Haiti where he is a private chef. He has represented Haiti in Australia, Ireland, St. Thomas and many countries around the globe and has cooked for the likes of British Prime Minister Tony Blair. He is the Founding Member and Vice President of The Haitian Culinary Alliance USA, a non-profit organization which promotes Haitian culture and gastronomy, while bringing to the forefront the many talented Chefs of Haitian and Caribbean descent. Tickets to Matinée Brouhaha! which takes place tomorrow Saturday 7/26 from 2 to 6PM can be purchased at www.lacayebk.com. Matinée Brouhaha! is a four course, three wine pairing feast designed by Chef Davidson D. Destinoble. The meal which will be offered on Saturday July 26 from 2-6PM will be preceded by a 45 minute wine and hors d’oeuvres tasting. The word BROUHAHA though French is believed to come from the hebrew "barúkh habá" meaning “welcome” -- literally “blessed is he who comes”. Menu items such as Salade Frisée avec Vinaigrette Anse-à-Veau au Miel and Acra d’Écrevisse de St Marc au Chutney de Mangue reflect Chef David’s origins in the Haitian seaside town of St-Marc and his professional skills in modern cooking trends. Chef David’s culinary philosophy and vision fall in line with the growing trend towards a healthier and more down-to-earth lifestyle. His preference is to allow the natural flavor of food to express itself. Listen online at http://www.blogtalkradio.com/blackwholeradio/2014/07/26/legacy-of-1804-with-chef-david-destinoble-haiti or on the phone at 323-927-2913. #LOF1804 is the hashtag for Twitter. Listen to past shows on iTunes or at www.kiskeacity.com under the LOF1804 tab. Join me tonight at 9PM as I welcome author, poet, comedian and educator MrJeffDess (Jeffery Dessources) to Legacy of 1804 to discuss his latest book Deconstructing Ratchet, his upcoming Kreyòl Korner Poetry Series at La Caye and maybe even his musings on Haitians in Hip Hop. Listen at http://www.blogtalkradio.com/blackwholeradio/2014/07/19/legacy-of-1804-with-mrjeffdess-spokenword-lof804 or on the phone at 323-927-2913. Digicel has blocked VoIP access (Viber, Tango etc) in Haiti, Trinidad and Jamaica. Other cell phone carriers such as Lime have done so as well. This has generated a firestorm on Caribbean social media, at least one petition and a reaction by the Trinidadian Telecom regulatory body which reinstated VoIPs in Trinidad while it deliberates the issue. Gary Dauphin, LA based Haitian-American digital media manager who spoke about net neutrality on LOF1804 a few weeks ago. Listen live at http://tobtr.com/s/6670679 or on the phone at 323-927-2913. You can listen to past shows at http://www.kiskeacity.com/search/label/LOF1804 or by searching "Legacy of 1804" or subscribing to the Black Whole Radio feed in iTunes. Speakers gave us an update of where things stand in their respective jurisdictions. In Trinidad services have been restored while TATT deliberates. In Haiti and Jamaica, applications are still blocked. Pascal Antoine pointed out that Digicel's competitor NatCom has not blocked VoIPs. Why have Haiti's Conatel and its Jamaican equivalent still not pronounced themselves on the VoIP block? Why are cell phone providers doing this block now? Have workaround applications to the block surfaced in the Caribbean? How long have cell phone providers wanted to block VoIPs? According to Michele Marius this is just the latest development in a long battle between carriers and VoIPs. Is this a dangerous precedent for net neutrality in the region and globally? What if Digicel decides it wants to block an app by a Haitian congressional candidate it does not like? What is the state of Caribbean innovation? Join me tonight at 9PM EA as I review recent Haiti news. - Zafen/Kiva small business loan partnership with Katleen Felix of HHTARG. - Clinton and Haitian peanuts. 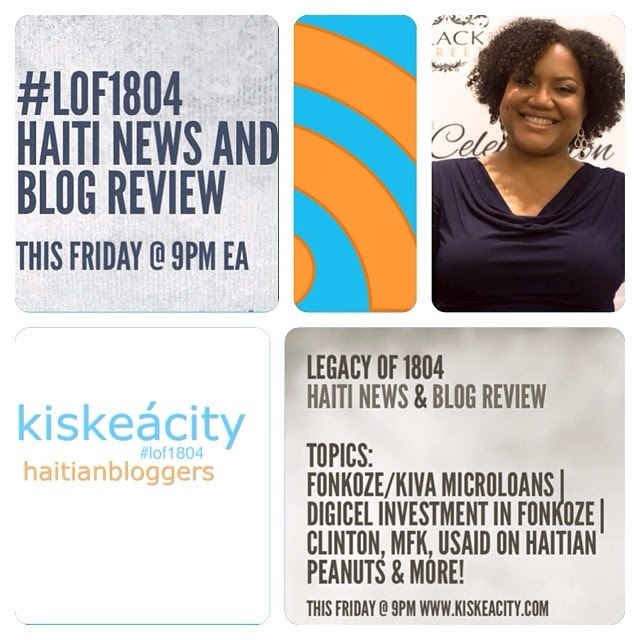 Listen live or archived at http://www.blogtalkradio.com/blackwholeradio/2014/07/05/legacy-of-1804-haiti-news-and-blog-review-lof1804 or 323-927-2913.